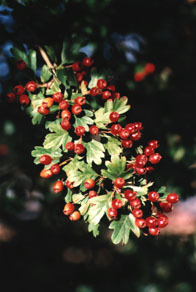 Growth Habit: Hawthorn is an up-right, prickly shrub which can grow to 6 metres in height (usually 2-4m). Often cultivated as a hedge species. Flowers: White, cream or pink flowers, 8 to 10 mm in diameter. Very showy sweet smelling clusters. Fruit/Seed: Red to deep red berries held in clusters, retained on the bushes after the leaves have fallen. Each berry contains a single oval brown seed. Dispersal: Berries are eaten by stock and birds. The seed passes through the gut of the animal and may be passed out far from the parent bush. Seed can also contaminate soil on farm machinery and be moved from one area to another. Suckers form when roots are disturbed. Distribution: Hawthorn was in the past planted as a cheap form of fencing. For this reason Hawthorn is found through out Tasmania adjacent to and on old homesteads sites. Status: Hawthorn is a Declared Noxious Weed in Victoria and South Australia. Hawthorn is not a declared weed in Tasmania. Seedlings rarely get established in pastures that are regularly grazed. However, when land is fenced off along creek lines or for shelter belts, or if stock are removed for periods of time, seedlings can reach a stage where their height and prickly nature ensure that they are able to withstand grazing pressure. Hawthorn can form dense, impenetrable thickets, dominating the understory and preventing access. There is a small cottage industry in collecting and drying Hawthorn flower, leaves and berries for distribution to the manufactures of medicinal herbal remedies. The well loved Tasmanian Hawthorn hedges are considered to be part of the cultural heritage that has made Tasmanian landscapes famous. While maintaining old hedges for heritage values, alternatives should be looked for when replacing damaged or dying Hawthorns. Planting new Hawthorn hedges or garden specimens, especially adjacent to bushland areas or stream reserves should be discouraged. Because it is capable of dominating native vegetation and produces large amounts of seed, Hawthorn does pose a threat to bushland, reserves and conservation areas in Tasmania. SubstitutionsIf people are looking for alternatives to Hawthorn for hedges and wind breaks they can contact the following organisations for advice. For further information on Hawthorne, contact the Department of Primary Industry, Water and Environment, Tasmania. Grubbing (all year). Carefully remove seedlings and small bushes using a mattock or spade. Herbicide (summer – autumn). Metsulfuron, triclopyr, triclopyr + picloram and glyphosate can be applied when the plant is actively growing, preferably after flowering. Basal bark and cut stump treatments are also effective.